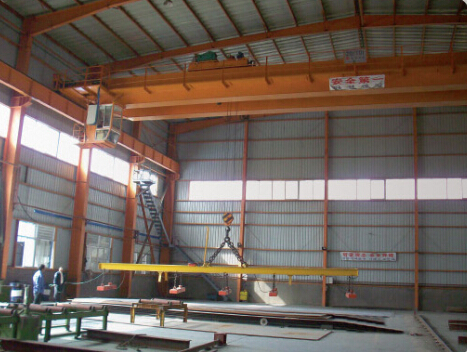 QA overhead crane with electromagnet，complying with GB/T14405-2011 standard has circular or rectangle electromagnet and relevant control system on the basis of QD crane.Therefore either hook or electromagnet can be selected for lifting tool. 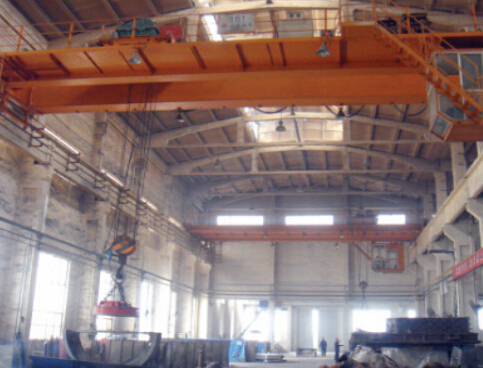 Range of lifting load(including the weight of electromagnet and other relevant lifting equipments)5t,10t,16/3.2t, 20/5t，32/5t. The machine is composed of boxed bridge，travelling mechanism trolley，electromagnet and electrical system. The basic features of bridge ,travelling mechanism and trolley are similar to those of QD orane .The magnetic capacity of electromagnet is adjustable and special measures have been taken to keep its magnetic force. The manipulation type is cab’s control, open or closed.